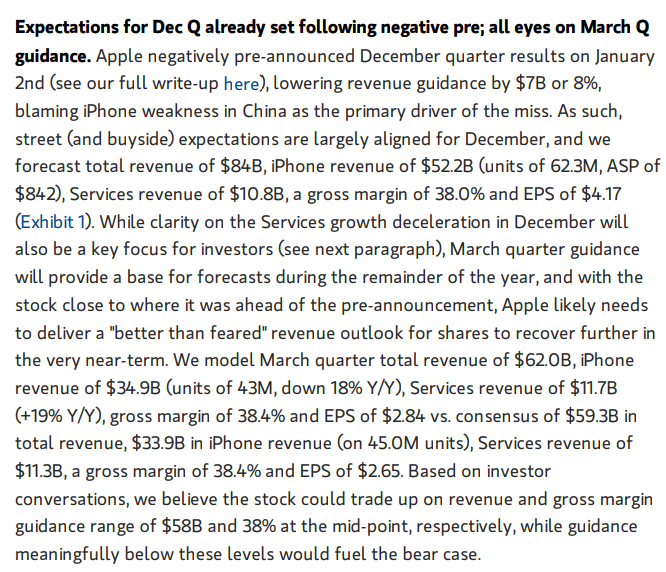 Apple (AAPL) will report its fiscal Q1 results tonight after the close. The options market is implying about a 5% move in either direction or about $11, which is only a tad rich to the average one-day post-earnings move of 4.3% over the last four quarters, and the 4.5% average move over the last ten years. we expected economic weakness in some emerging markets. This turned out to have a significantly greater impact than we had projected. 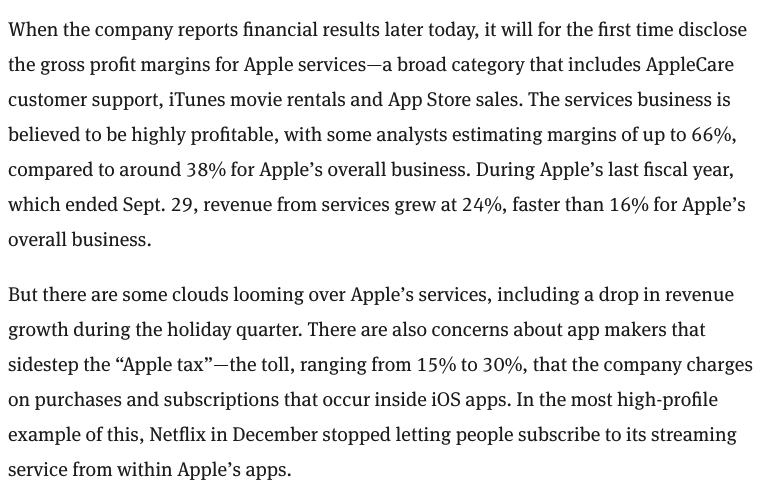 So we are going to get less transparency on iPhone unit sales and more on Services, that will show a higher level of profitability than their hardware, but its growth is reliant on the growth of their installed base, which is stalling. MY TAKE INTO THE PRINT: On Jan 2nd I was shocked at the lack of visibility the company had when they had given their Dec quarter guidance on Nov 1st, one month into the quarter. While the stock had already sold off nearly 30% from Nov 1 to Jan 2nd, likely already incorporating negative investor sentiment, I would also be surprised if the conditions that caused the Dec quarter miss abated to the point that gave the company enough visibility and thus confidence to raise expectations for the current quarter. It would take another meaningful guide down for the company to outperform the implied move to the downside. It would take a very unexpected beat and raise for the stock to outperform the implied move to the upside, and that I suspect would be an opportunity for skeptical longs to trim their positions. The most likely outcome is that the stock is up or down in the range of the implied move. Profits of the stock up to 165, stock called away above that, but the long holder could always cover the short call for a loss to keep the long position in place. Losses of the stock down to 146, protected below that. Rationale:if you are long, more worried about a downdraft between now and Dec expiration, than a breakout to new highs, then this hedge idea makes sense for those looking to hold onto the position into the new year but want to define their risk to the downside. Profits of up to 15.50 between 164.50 and 180 with max gain of 15.50 above 180. Losses of up to 4.50 between 160 and 164.50 with max loss of 4.50 below 160. Rationale: this trade breaks even up 5% (about the implied move for earnings), offers a 3 to 1 potential payout if the stock is up at 180 on March expiration. Profits of up to 10 between 152 and 142 with max gain of 10 at 142 or lower. Losses of up to 3 between 152 and 155 with max loss of 3 at 155 or higher. 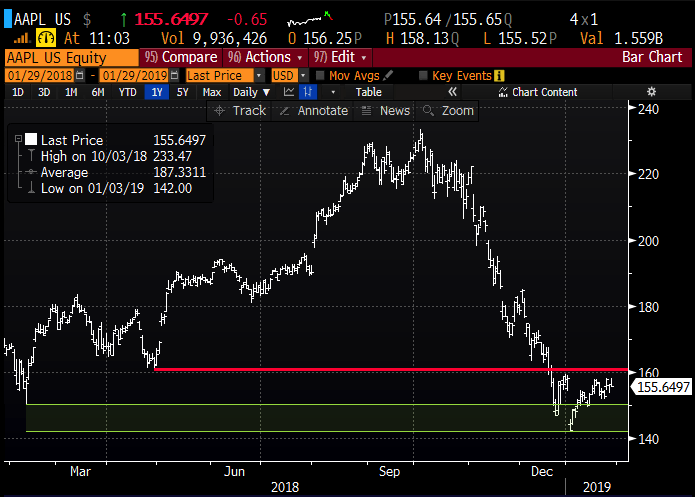 Rationale: this is a 3 day trade, risking 2% of the stock price that the stock will be down at least 2.9% this week with the potential to make up to 6.4% of the stock price if the stock is at or below $142.